"Antisemites are not your friends". That was the message that Uri Avnery and Yossi Sarid told their respective audiences as they watched the spectacular box-office success of Mel Gibson’s “The Passion of the Christ”. The interesting thing is that their message was identical, but their intended readership was very different. The "Passion" is on its way to becoming Hollywood's number one blockbuster. From the outset, it would never have made it to the big screen unless it had a sure chance of becoming a major hit. Gibson is familiar with the American soul, with the world's soul, and he also knows for sure that a movie like this, at this time, will ride on the high waves of Christian fundamentalism in his country and in others. Without supportive surroundings, Gibson, who is not exactly known as a modern-day Shakespeare, would not have dared make this movie. Within these surroundings are to be found the best friends of Ariel Sharon, Benjamin Netanyahu, Beni Elon, Nathan Sharansky and Effi Eitam, who are fighting fiercely, as we all know, against anti-Semitism. Sharon, Netanyahu, Elon and their friends have long entered into a blood pact, of ketchup, with the more anti-Semitic Christian groups in America, who pretend to be sworn friends of Israel…. The Israeli government's battle against anti-Semitism is hypocritical, because it is selective. We are ready to join forces with anti-Semitic zealots, even with certain Holocaust deniers, if they are just willing to support the policies of the Sharon government… With friends like these, who vote en masse for Haider and flock en masse to see Gibson's movie, there's no need for enemies; because enemies such as these friends are hoping to inherit this land in a war of Armageddon, whose advent, if it is taking time, maybe needs to be sped up. The present sufferings of the Palestinian people - which we, as ‎‎Israelis and Jews, oppose and fight against - have no connection with ‎‎what happened - or not - some 1973 years ago. If there is any connection at all, it is the other way round. Without ‎‎modern Christian anti-Semitism, the Zionist movement would not have ‎‎been born at all… ‎‎Anti-Semitism was and is the force that drives the Jews to Palestine. 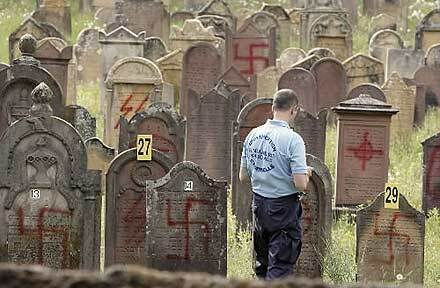 Without anti-Semitism, the Zionist vision would have remained an ‎‎abstract idea. From the pogrom of Kishinev, through the Holocaust to ‎‎the anti-Semitism in Russia that has recently driven more than a million ‎‎Jews to Israel - anti-Semitism was and remains the most dangerous ‎‎enemy of the Palestinian people. There is much truth in the saying that ‎‎the Palestinians are "the victims of the victims". ‎On top of all the moral reasons, this is an additional argument ‎‎against a statement about the crucifixion that can be construed by ‎‎anti-Semites as an encouragement for their cause. When peace comes, we shall all meet in Jerusalem, Jews, Christians ‎‎and Muslims. So the message of both Sarid's and Avnery's articles, to Palestinians and Israeli Jews alike, is that no matter how badly you think you need friends right now, there are some friends you never need. Les profanateurs en série ont trouvé leur terre d'élection : l'Alsace. Après — entre autres — les 50 tombes musulmanes taguées d'inscriptions néo-nazies le 13 juin dans un cimetière de Strasbourg et la profanation de 127 tombes au cimetière juif d'Herrlisheim, près de Colmar, fin avril, une cinquantaine de tombes musulmanes du cimetière militaire de Haguenau (Bas-Rhin) ont été recouvertes d'inscriptions racistes, de croix gammées et de sigles nazis tracés à l'encre rouge dans la nuit de mercredi à jeudi. Des dizaines de stèles ont aussi été jetées à terre dans ce cimetière abritant des «combattants musulmans morts pour la France» pendant la Première ou la Seconde Guerre mondiale. Trans: The serial desecrators have found their preferred turf: Alsace. After - among others - the 50 Muslim graves sprayed with neo-Nazi inscriptions on 13 June in a Strasbourg cemetery and the desecration of 127 graves in the Jewish cemetery in Herrlisheim, near Colmar, at the end of April, about 50 Muslim graves in Haguenau military cemetery (in Bas Rhin) have been defaced with racist slogans, swastikas and Nazi symbols, written in red paint on Wednesday night [23 June]. Tens of gravestones were also overturned in this cemetery, commemorating "Muslims soldiers who died for France" during the First and Second World Wars. When Abu Nidal, formerly head of the PLO-General Command, died in Baghdad in August 2002 ("committed suicide by shooting himself several times in the head" as the Iraqi press agency laconically put it), Time Magazine noted that he had successfully disproved the old maxim that "The enemy of my enemy is my friend". In the west, Abu Nidal was notorious for bloody and spectacular attacks on Israeli and Jewish targets, but in the Arab world he was known for his hatred (and murder) of those PLO members who favored negotiations over force and for the fratricidal bloodletting that tore his own Palestinian faction apart. In death, he achieved the rare feat of being equally unmourned by Palestinians and Israelis alike. Perhaps by the same token, Israelis and Palestinians might look at the photos from Haguenau and Colmar, and learn the same lesson that Abu Nidal once taught them: that sometimes the enemy of my enemy is...well, still the enemy. Thanks Lawrence !.. Great post indeed.